IMG Worldwide and The Color Run(TM) Extend Multi-Year Agreement for Continued Growth of "The Happiest 5k on the Planet"
LOS ANGELES, CA -- (Marketwired) -- 04/15/14 -- IMG, the global sports, fashion and media company, and The Color Run, LLC, a unique 5K paint race event series, officially announced the extension of its partnership agreement for the expansion of The Color Run into dozens of countries across Europe, the Middle East and Asia. With no winners or official times, The Color Run celebrates healthiness, happiness, and individuality, bringing the community together to create a five-kilometer canvas of colorful fun in which thousands of participants are doused from head to toe in different colors at each kilometer. Already in 2014, IMG has produced events in Jakarta, Abu Dhabi, Shenzhen and Tokyo; and this past weekend, successfully produced sold-out events in Paris and at a second Tokyo stop. In addition, IMG has announced an aggressive slate of events across the globe in major markets like Hong Kong, Shanghai, Beijing, Singapore, Seoul, Bangkok, Kuala Lumpur, Dubai, Barcelona, Madrid, Amsterdam, Brussels, London, Dublin, Manchester, Toronto, Vancouver and many more. IMG continues to add countries to its portfolio with a new focus on the Middle East with the addition of Qatar, Kuwait, Lebanon and Egypt. "The Color Run has been a phenomenal success," said James Leitz, Senior Vice President and Global Director of IMG Action Sports, the division that manages the roll out of the series for IMG. "The IMG offices and personnel around the world have embraced The Color Run format, IP, and digital marketing strategies to create a property that transcends boarders and has united a global community of color runners." "When you combine the reach of IMG's global network and corporate relationships, with an event series that has revolutionized the way we communicate to the consumer, The Color Run has grown into a valuable sports and lifestyle property," added Leitz. IMG's success with The Color Run has secured innovative corporate sponsorships from New Balance, Dulux, Lipton, General Mills, and others on a per country and pan-regional basis. 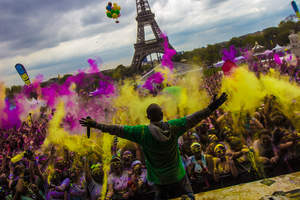 "We are very excited to continue our expansion into even more global communities," said The Color Run Founder and CEO Travis Snyder. "In 2014, The Color Run will be hosted in more than 50 countries and over 110 cities internationally. The reception has exceeded our wildest expectations and we are elated to host this happy event in such iconic cities across the world." The Color Run employs social media marketing platforms to impact millions of customers resulting in broader, deeper and more meaningful engagement. With more than 3.5 million likes on Facebook, 9 million views on YouTube, 104,000 followers on Instagram and 80,000 followers on Twitter, The Color Run has the largest engaged fan base in mass participation sport. IMG Worldwide is a global sports, entertainment and media business, with nearly 3,000 employees operating in 30 countries around the globe. IMG's areas of expertise are diverse and wide ranging: IMG College; IMG's Joint Ventures in China, Brazil and India and Turkey; IMG Media; IMG Events and Federations; IMG Fashion; IMG Models; IMG Art+Commerce; IMG Clients; IMG Academies; IMG Consulting and IMG Licensing. More information is available at www.img.com. Follow us on Twitter (https://twitter.com/#!/IMG_Worldwide) and like us on Facebook (http://www.facebook.com/IMGWorldwide). The Color Run is the largest event series in the United States and the first of its kind. Travis Snyder founded the 5k paint race event series in 2012, creating a new genre of running event. The Color Run celebrates healthiness, happiness and individuality, bringing the community together to create a five-kilometer canvas of colorful fun. To learn more about The Color Run, visit www.thecolorrun.com or watch this video.